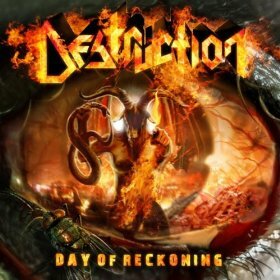 Hall of the Mountain King: Review: Destruction, "Day of Reckoning"
Did anyone happen to get the license plate of the truck that just hit me? Over and over. For about an hour. Growing up in a rural area long before the internet showed up in every household giving people access to music from around the world, I was a latecomer to Destruction. I was already familiar with their fellow countrymen Kreator and Sodom when I discovered them, but for some reason Destruction spoke to me more than those other two bands. I’ll admit I’m still not the biggest fan of the German thrash scene, but when the mood strikes me, I’ll probably be reaching for Destruction. And their latest, Day of Reckoning, is just as good an option as any from their catalog. The first thing you’ll notice about this record is that it sounds really, really good. The production is as sharp as a scalpel, and the songs themselves are like the crazy, wild-eyed guy in the doctor’s scrubs staggering toward you waving it. Despite the immediate speed and aggression of “The Price,” it’s the second track, “Hate is My Fuel” that makes the first impact with a huge, memorable chorus. That plays nicely into “Armagedoonizer,” which takes a slightly different approach in the guitar riff, calling on just a little traditional metal. That’s reinforced in the chorus with its harmonized vocals that are reminiscent of Judas Priest. It’s a little strange at first, but grows on you after a few listens. There are some pretty standard German thrash numbers scattered throughout the record that are perhaps a little too familiar, but most of the songs bring at least a little something different and recognizable to the table. One of the most interesting and one of my favorites is “Devil’s Advocate,” which brings just a little bit of swing with the guitars of Mike Sifringer and new drummer Vaaver. “Sorceror of Black Magic” gives Schmier’s bass a little bit of a spotlight and features a more traditional metal feel early on the verses. When it moves into thrash territory, it becomes less interesting, though Sifringer does deliver some nice licks on the chorus. The harmonic guitar riffing on “The Demon is God” is cool and something a little different, and “Church of Disgust,” which features more great riffing, is one of the more memorable numbers despite it’s predictable religious themes. Lyrically, the album is perhaps a bit lacking in places, but given the conviction and aggression it’s delivered with, you can overlook that. Day of Reckoning is relentless from beginning to end, and while most fans will probably argue Destruction’s earlier work was better, this is one hell of a thrash record.